I always knew Kermit and I were soulmates. If I attempt to start my day without my cup of tea, the whole world (and everyone and everything in it) seems utterly intolerable. But with a mug of that calming, revitalizing elixr in hand, all things are possible. And if the below cross-promotion for Lipton and the upcoming “Muppets Most Wanted” movie is any indication, Mr. The-Frog feels the same way. The spot from London agency adam&eveDDB shows Kermit navigating a hectic, noisy, zany and muppet-filled New York City with harmonious ease, all because he knows that the secret to a balanced, calm, and happy life lies within oneself (and a steaming mug of Lipton tea). I have to admit that the accompanying hashtag #BeMoreTea doesn’t quite make sense to me; I think the campaign is trying to make the word “tea” work as a synonym for “calm” or “harmonious,” but it just doesn’t quite seem to get there, and so the hashtag feels like it’s missing a word and should read something like #BeMoreLikeTea or #HaveMoreTea or something. That said, I get what it’s aiming for, and the whole thing is just too sweet and too much fun to knock too harshly. 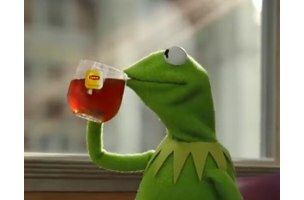 Plus, it seems the age-old question of how Kermit could possibly tolerate the abrasive, self-absorbed, shrill Miss Piggy has finally been answered: his blood must be pure Lipton tea.